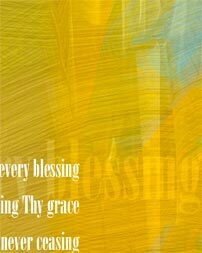 Share a hymn with these free-to-distribute greeting cards, Christmas ornaments, and other Hymnscript art samples. Do you know what’s behind the classic Christian hymns? The artist’s favorite books, recordings, and other Christian hymn resources! Thank you for the beautiful bookmarks. I will be sharing them with a group at our church and I am sure they will be the BIG hit I expect them to be.